We’d love your help. Let us know what’s wrong with this preview of Flawed Plan by Amabel Daniels. Do you dare to read all eight? To ask other readers questions about Flawed Plan, please sign up. I really enjoyed Flawed Plan. This is my first book by this author, and I was really impressed. I have been reading the Crimson Falls novellas, and they are all fantastic! In this novella, one prank has turned into a horrible nightmare for a teen girl who is already a Target for the bullies. Renee is a strong character, and all in all, this was a very well written story, with a well developed plot that grabbed me and never let go! 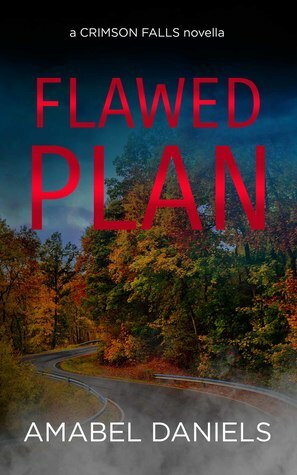 Flawed Plan is my first read by Amabel Daniel's and I really enjoyed how she kept story moving along without losing any of the fear or strength of the lead character. Just one more outstanding page turning suspense/thriller in the Crimson Falls series. As a student, most of us have experienced clicks and bullies in school among our so called peers. But this story follows one student that experiences being different to another level where even the teachers, police and others treat her as not qui Flawed Plan is my first read by Amabel Daniel's and I really enjoyed how she kept story moving along without losing any of the fear or strength of the lead character. Just one more outstanding page turning suspense/thriller in the Crimson Falls series. As a student, most of us have experienced clicks and bullies in school among our so called peers. But this story follows one student that experiences being different to another level where even the teachers, police and others treat her as not quite there so not to be believed. When she witnesses a fellow student and only friend being killed, she has no idea who to turn to, who would believe her? Can she overcome her fear of being belittled and ostracized by her fellow students, teacher and others to ensure the culprits are brought to justice and avenge the victim? Well, this is Crimson Falls in October and who knows what the "curse" will bring about. Claiming five stars from me for this YA coming of age story about bullying, friendship, revenge and personal strength. Another ending I didn't coming. Crimson falls may just very well be my favorite town of horror. Renee is an outcast who witnesses something horrible which creates all kinds of crazy. What happens when a 'prank' goes wrong? Amabel did a wonderful job showing how one small thing can change everything. The mystery and suspense was great! What a great book. Kept me guessing and loved the turns with all the characters. Great read! Amabel Daniels’ Flawed Plan was just that...one flaw in the plan after the other all leading to one unexpected conclusion! I couldn’t read this book fast enough. With a relatable MC, this unique mystery will keep you on the edge of your seat, anxious to reach the stunning conclusion. A twisted YA mystery with epic stakes and a refreshing story. It was unlike anything I’ve ever read. We've all come across bullies like the ones in this story, but you've never read a heroine like Renee. A perfect mix of nostalgia for growing up and mystery! A powerful story of friendship and revenge that keeps you guessing until the very end. I loved Renee's story. She is bullied in school with one true friend, Jackson. Since she is deaf, she can read lips. She reads the lips of her bullies as theu plan to egg her friends car as he drives home. As she tries to warn him, she watches as his window is hit with an egg. He skids and slams through trees, diving hood first into the water. Assuming he is dead, Renee flees. Then Ashlyn, claims he is driving past her house. Other pranks are happening to. Is Twisted, intriging, and suspenseful! I loved Renee's story. She is bullied in school with one true friend, Jackson. Since she is deaf, she can read lips. She reads the lips of her bullies as theu plan to egg her friends car as he drives home. As she tries to warn him, she watches as his window is hit with an egg. He skids and slams through trees, diving hood first into the water. Assuming he is dead, Renee flees. Then Ashlyn, claims he is driving past her house. Other pranks are happening to. Is this the curse of Founders Day? Is Jackson haunting them? Renee has been bullied by the three kids that are never reprimanded for it. What can she do when she learns of their attempt to bully her best friend Jackson? Especially when that bullying turns terrifying? The suspense was great in this story. I couldn't wait to find out what was going to happen next and to find out if the bullies were going to get what was coming to them. I would have loved to see a little bit more of a relationship between Renee and Jackson during this novella though. What a great suspenseful book! Talk about a prank gone horribly wrong and poor Renee who’s already on the bullies radar, happened to witness the prank against her friend, Jackson. She is such a courageous and admirable heroine and Ms. Daniels really shows off her talent here with the way she wrote her character. I was impressed by the plot and I definitely did not expect the plot twist at the end! A powerful story of friendship, bullying, and revenge. Not only is the lead female bullied by a trio of classmates, many adults in the community do not treat her well either. A smart twist at the end. Well written, with a well-developed plot that is not the typical teen/YA story. I enjoyed this quick read mystery and it held my attention throughout. A fantastic read that grabs you right from the start. It gets you heart pounding and adrenaline rush from the first page as you feel through the Author how the Character Renee Harding. Once you start reading you won't be able to put the book down. A fantastic read from the crimson falls I definitely recommend this read. This book was very realistic. It makes you realize just how cruel people can be, and show no remorse. Renee fought whether to tell, who to tell, would anyone even believe her.